No. 15, Block A, Lot 756, Prime Subang Light Industrial Park, Jalan Subang 3, Off Persiaran Subang, 47610 Subang Jaya, Selangor, Malaysia. 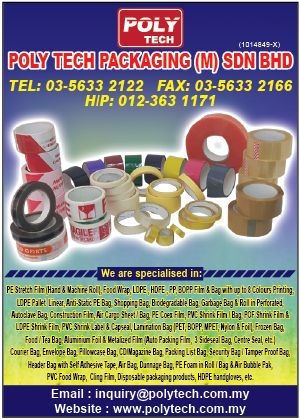 Poly Tech Packaging (M) Sdn Bhd (Poly Tech) was established in the early part of 2007, which formerly known as Poly Tech Packaging Enterprise. Due to overwhelming demand and support from our satisfied clients. In 2012 Poly Tech Packaging Enterprise, was change to Poly Tech Packaging Enterprise and ventured into the market of LDPE, HDPE, PP, BOPP, PET, Nylon & Aluminum Foil packaging film. 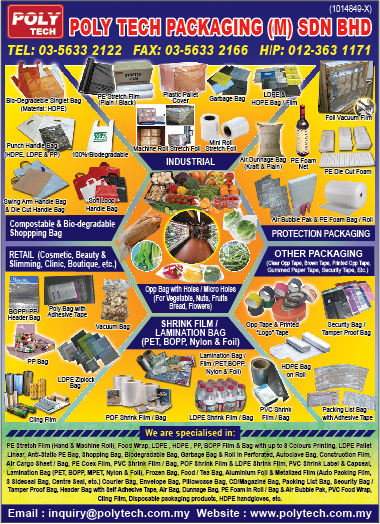 Poly Tech Packaging (M) Sdn Bhd, objectives is to provide an effective and efficient alternative in products and services to various industries, which included food industry, Pharmaceutical industry, Cosmetics and personal care, Logistic & Packer, etc.